Details about JACK WILD & MARK LESTER OLIVER! SIGNED CHILD ACTOR AUTOGRAPHS VERY YOUNG RARE!!! 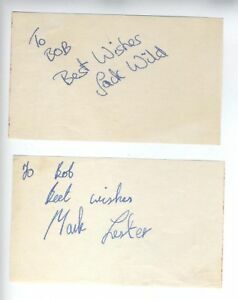 JACK WILD & MARK LESTER OLIVER! SIGNED CHILD ACTOR AUTOGRAPHS VERY YOUNG RARE!! !